That’s right. Although most Canadians don’t realize it, eating the right foods – along with other simple lifestyle changes like quitting smoking and exercising regularly – can go a long way to helping you prevent avoidable but serious eye diseases like age-related macular degeneration (AMD) and cataracts. 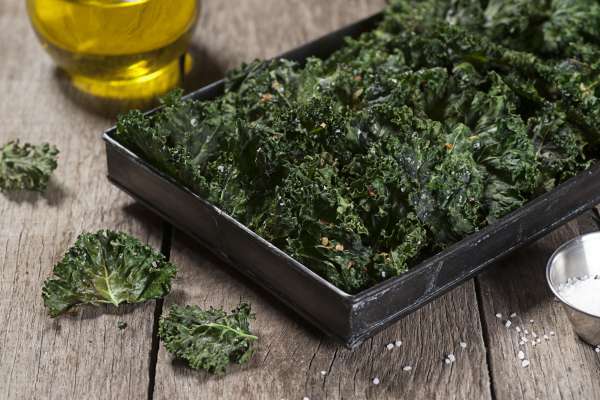 Try these crunchy kale chips which are chock full of vitamins and nutrients that are great for your eyes. Wash, then dry the kale in either a salad spinner or on a clean tea towel. Tear the kale leaves into bite-sized pieces, discarding the tough central part. Drizzle with a little olive oil and, working with your hands, rub the leaves gently so all of the kale has a light coating of oil. Place on a baking sheet in one layer. Sprinkle a pinch of salt over the kale. Ask an adult to put the baking sheet in the oven. Allow to bake for 20 minutes. Watch the kale to make sure it does not burn. Remove the baking sheet from the oven when the leaves are crispy.